For the Los Lobos album, see Si Se Puede! For the Spanish political party, see Podemos (Spanish political party). "Sí, se puede" (Spanish for "Yes, it is possible" or, roughly, "Yes, we can"; pronounced [ˈsi se ˈpwe.ðe]) is the motto of the United Farm Workers of America, and has since been taken up by other activist groups. In 1972, during Cesar Chavez's 25-day fast in Phoenix, Arizona, UFW's co-founder, Dolores Huerta, came up with the slogan. "Sí se puede" has long been a UFW guiding principle that has served to inspire accomplishment of goals. The phrase is a federally registered trademark of the UFW. The phrase has been widely adopted by other labor unions and civil rights organizations and drew widespread political and media attention as a rallying cry during the U.S. immigration reform protests. "Sí se puede" is usually translated in English as "It can be done", or "Yes you can". The more literal translation that the United Farm Workers uses is "Yes, it can be done!" Use of the slogan by the Obama campaign in Austin, Texas. Translated, it reads, "Yes we can, Texas!" President Barack Obama adopted the English version "Yes, we can!" first during the 2004 Illinois Democratic primary race for U.S. Senate, and it became a slogan of his 2008 presidential campaign. "Yes, we can!" was the theme of Senator Obama's speech following his second-place finish in the 2008 New Hampshire primary. The phrase was also used in the song "Yes We Can", which was performed by numerous celebrities in support of Obama. (Huerta endorsed Hillary Clinton in her campaign for the Democratic nomination for presidency in 2007). "Sí, se puede!" became the slogan and rallying cry of Venezuelan Juan Guaidó following his decision to declare himself president in the 2019 Venezuelan presidential crisis. Guaidó was compared to Obama in this and other ways at the time. During the Israeli legislative election campaign of 2009, Shas used a Hebrew language version of the slogan: "כן. אנחנו יכולים" (ken, anakhnu yekholim). After AeroMexico, a Mexican airline, had filed a trademark application for "Sí se puede" with the US Trademark Office, lawyers for the United Farm Workers defended the phrase as the intellectual property of the UFW. After litigation, AeroMexico agreed not to use the phrase and abandoned its trademark application. ^ a b c Arturo S. Rodriguez (1998-03-31). "Statement from Arturo S. Rodriguez, President, United Farm Workers of America, Celebrating Cesar Chavez's Birthday 3/31/98-La Paz, Keene, Calif". Press Releases. United Farm Workers. Retrieved 2006-12-09. ^ "Sí Se Puede". Makers. Retrieved 31 May 2017. ^ (CBS/AP) (April 11, 2006). ""¡Si, Se Puede!" Say Immigrants Rallies In Dozens Of Cities Compared By Some To Civil Rights Campaigns". CBS NEWS / The Associated Press. CBS Broadcasting Inc. Retrieved 2008-01-09. ^ "The earth is shaking as immigrants rise up around the country with their voices singing "Sí se puede"—Yes, we can. This uprising is in the best tradition of the American Dream and the civil rights struggle for freedom." Reverend Jesse L. Jackson, Sr. (August 13, 2006). 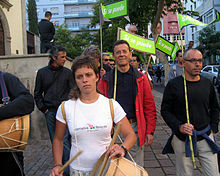 ""Sí Se Puede" Means "We Shall Overcome"". Motion Magazine. ^ LeRoy Chatfield; et al. (UFW volunteers). "UFW GLOSSARY Farmworker Movement Terminology". Farmworker Movement Documentation Project. Si Se Puede Press. Retrieved 2006-12-09. ^ Gerald Erichsen (April 11, 2006). "Does 'Sí, se puede' mean 'Yes, we can'?". ThoughtCo. Retrieved 2008-01-09. ^ Elizabeth Brackett (July 27, 2004). "Rising Star". PBS. Retrieved 2008-02-19. ^ La Ganga, Maria L. (January 9, 2008). "Obama has new rallying cry: Yes, we can!". Los Angeles Times. Retrieved 2008-01-09. ^ "Press Release - Human Rights Leader Dolores Huerta Endorses Clinton". ucsb.edu. The American Presidency Project. May 18, 2007. Retrieved July 28, 2018. ^ Eli Yishai (December 15, 2008). "Shas Facebook page". Shas Facebook page. facebook.com. Retrieved 2016-08-14.